Today, to inaugurate this new project I decided to start with Colombian arepas. I was thinking a lot of what could be the main ingredient to represent my birth country, and without a doubt is the much adored arepa. So anyway, what in the world is an arepa? 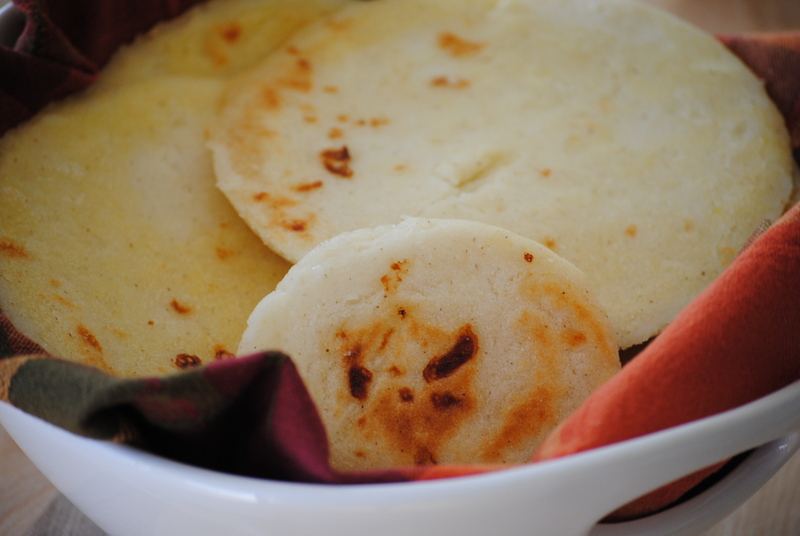 For us Colombians the arepa is an essential ingredient of every dish in our country. We eat it for breakfast, lunch, dinner, with eggs, butter, meat, bacon, as a side dish for soups, stews, beans, in short, we eat it daily and to many, if their plate does not come with the blessed arepa, they’re not satisfied. 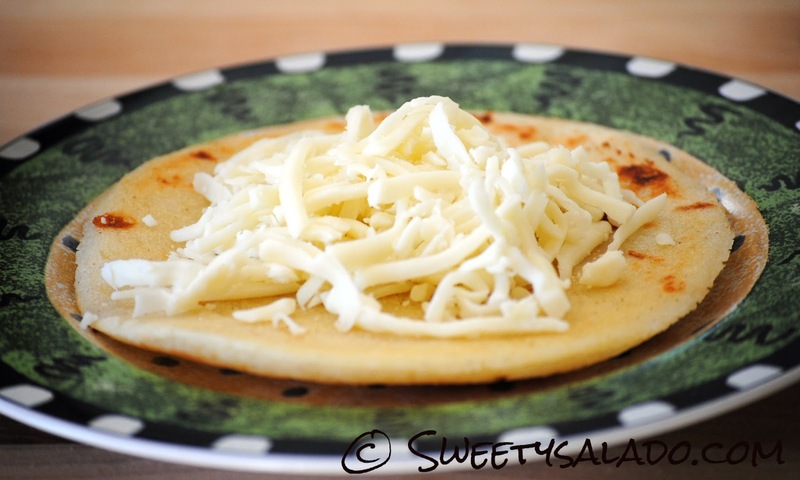 The arepa is a type of tortilla made from corn. The aborigines who inhabited what is now Colombia and Venezuela were the creators of this product, which even today is an integral part of our cuisine. But of course, back then they had to peel the cob, cook the corn, grind it, make the arepas and then cook them. In fact, I had the pleasure of watching my mom and my great aunt get up every day at 5 in the morning to make the arepas of the day, but I imagine that for them it was not as fun to get up so early in the day to make a whole bunch of arepas. Fortunately, today that corn meal is sold ready to knead and it comes not only already ground, but also pre-cooked. What could be easier than that? I cannot emphasize enough that the corn meal has to be made especially for… well, arepas! You’re going to find all kinds of different brands and any of them will do as long as they are made especially for arepas. Don’t use the Mexican flour that is used for tamales. Don’t use regular yellow corn meal. And please, please, PLEASE, do not use pancake flour because then they wouldn’t be arepas, they would be pancakes. And where do you find the corn meal? In most Latin grocery stores, almost guaranteed. You can also try to find it online. the corn meal and grill them on the stove, others use milk instead of water and others, like me, use cheese and butter so they can have a golden, delicious crust. Mix the water, salt, corn meal, butter and cheese in a bowl large enough to knead the dough. Knead until all the ingredients are mixed well and the dough has a soft consistency. If the dough is too dry, add a little bit more water. If it’s too wet, add more corn meal. Start forming balls the size of a medium orange and place them between two sheets of plastic. Flatten them with a rolling pin to your desired thickness. Cut the dough through the top plastic sheet with a bowl, glass, cookie cutter, etc., take off the plastic, the excess dough and now you have a perfectly shaped arepa. Cover a griddle or pan with butter spray or a stick butter. Turn on the stove on to medium high and when the griddle is hot enough, add the arepas and grill them for 5 minutes on each side or until they are golden brown. Serve immediately. Hi fitange, nice to see you here! Unfortunately, the only corn meal that works is the one specifically for arepas and the package will say that. I know there is a large Colombian community in Australia, so you may be able to find it in a Latin grocery store (maybe? ); if not, then ordering from an web site such as Amigofoods.com or Amazon.com may help. But no, regular yellow cornmeal will not work and I've heard some people say that polenta works and others have said that it doesn't. I can't say because I have never used it, plus, I don't think the flavor would be the same. Hi fitange, there is van awesome Colombia deli on 215 Buthurst st , Sydney . You will find the flour and even frozen arepas!!!!! Hi, I'm Colombian and I feel so proud about your recipe because is a pretty good tribute to this delicious Colombian typical food. Hello my name is enelvia first time on your web site I was wondering if we can deep fry them? Hi enelvia! Yes, you can deep fry them if you want, in fact, there is a Colombian arepa called "arepa de huevo" that is deep fried. They make it thick, fry it, then they cut a hole on the side, put a whole egg and deep fry it again. It's amazing! Hola Diana! Gracias por tu recieta! I just made these for my fiancee and he loved them! I used to have to buy the refrigerated arepas, and they did not taste very good. I was able to try arepas out at a street fair with many Colombian cooks, and I simply feel in love with all the cooking! I am so grateful for you site, because I can try out these wonderful dishes and I do not have to wait for a festival! Un million de gracias! Francine! Hola DIANA . I was born in Colombia and raised in Toronto Canada. Thank you for your recipe's I just tried the recipe to make Colombian arepas wow so delicious I loved it.looking forward to cook more of sweet y salado recipes. Hi Diana, have you ever tried using the food processor to mix the ingredients like with your pandebono recipe? Hi Diana, I haven't but this cornmeal is so easy to work with that a food processor is not needed.